Sannyasa implies cutting off all personal ties to family, business and social life. One no longer lives as an individual but as an instrument of God. A Sannyasi accepts the whole world as his family. He belongs to and is related to all living beings. The Sannyasa ceremony therefore involves fasting and a series of ritual steps which symbolize the cutting of all relations and the final performance of all the obligatory duties of an individual. These include giving up of the sacred thread which symbolizes one’s status or role in society, offering food to the departed souls of the ancestors for the last time and also performing one’s own ‘sradda‘ (funeral rites) ceremony thereby indicating the death of the selfish individuality. The Sannyasis-to-be go to the sea shore in order to perform the obligatory offering of food (to the ancestors) for the last time. They also conduct their own funeral rites and offer food to themselves, thereby freeing the future generations from this obligation of offering food to the departed souls of these monks. The food offerings consist of balls of rice called ‘pindam’. After the ceremony, the pindams are respectfully placed in the sea. After this, a Viraja homa is performed during which the monks take up the formal vows of renunciation. 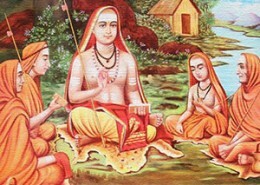 Then the monks accept the ochre robes, indicating Sannyasa, from the Guru. The Guru also confers new names upon the monks. The next day before dawn the Viraja Homa is performed and the Sannyasis-to-be recite mantras which reveal the aims and the glory of Sannyasa. After the performance of the fire ceremony, the monks meditate for some time. After the meditation, Amma gives the monks the ochre robes signifying Sannyasa. 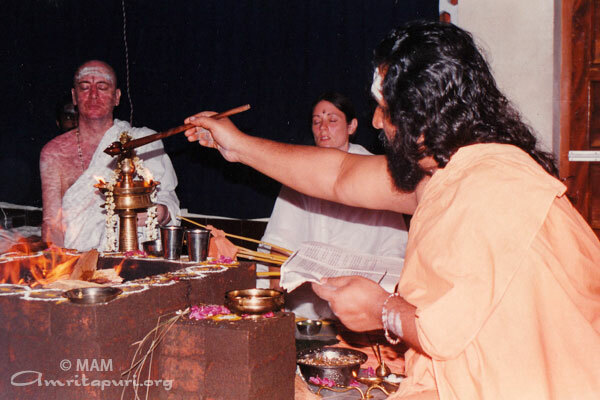 The ochre colour signifies the flame of renunciation which is to be kept kindled in the hearts of the Sannyasis. 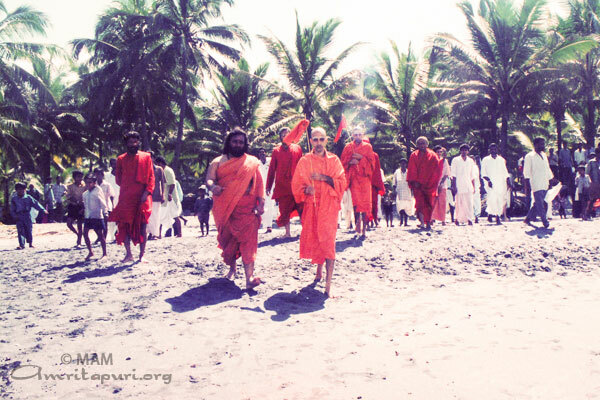 After donning the ochre robes the Sannyasis leave the main temple to go to the sea shore, accompanied by the senior Sannyasis. At the sea shore, they offer prayers to the Divine Mother in the form of the Sea. Following the traditions of the Puri order, the Sannyasis break the sticks given to them at the time of initiation and cast them into the sea. On their return to the main temple, Amma announces the new name of each Sannyasi. These names remind them of their goal in life. 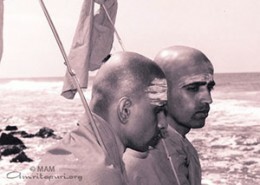 The names of the Swamis are suffixed with ‘Ananda’ (bliss) and Puri. The names of Swaminis are suffixed with Prana (life breath). Name – for interaction in the world, Ananda – their state of Bliss and Puri (or Prana) is the order of Sannyasis in Shankara Parampara. Amma then asks all the people assembled there to repeat aloud the name of the Sannyasi three times and to pray to the Almighty to grant strength to the Sannyasis to live up to the noble ideals of Sannyasa. The newly initiated Sannyasis then go and beg for food, in keeping with the ancient tradition of renunciates. 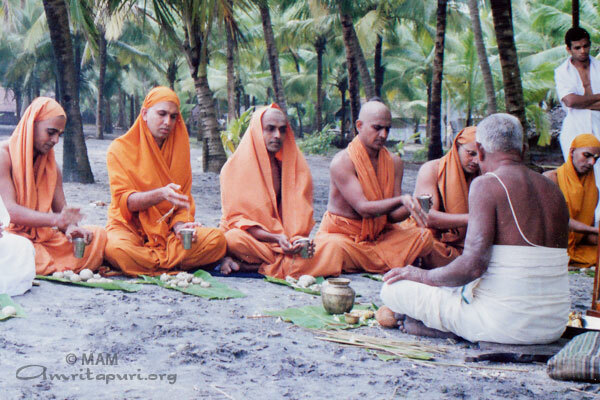 Amma sets the process in motion by giving some rice to a newly initiated Sannyasi. 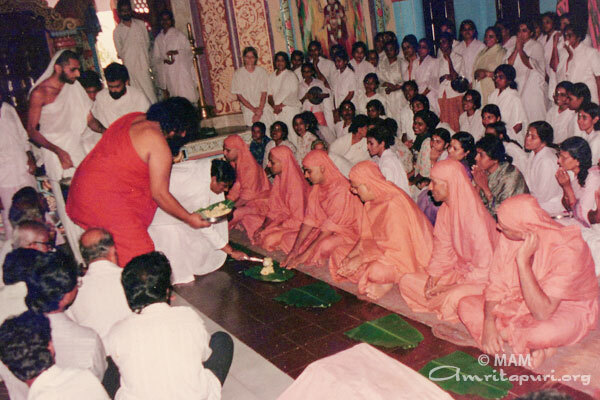 After the food items obtained are cooked, the Sannyasis, after three days of fasting, sit down for their first meal, lovingly served by Amma in the temple.